Exige Promotions and Events is a national promotional company which is fully operational throughout South Africa. Need promotional staff? No problem! We have over 2000 vibrant, professional and reliable girls and guys on our books in all the major cities in South Africa for all your eventing needs. From brand ambassadors to hostesses, registration staff to models available for castings and photo shoots, waitrons to bartenders etc… we have you covered! We strive to provide peace of mind and professionalism to ensure your event and brand activations run smoothly, so as to give you, our clients, the maximum exposure form your event or activation. Through our vigorous screening processes, we ensure that all selected staff are perfect for each and every client, catering to their specific needs. Our elite level of service will exceed your wildest expectations. 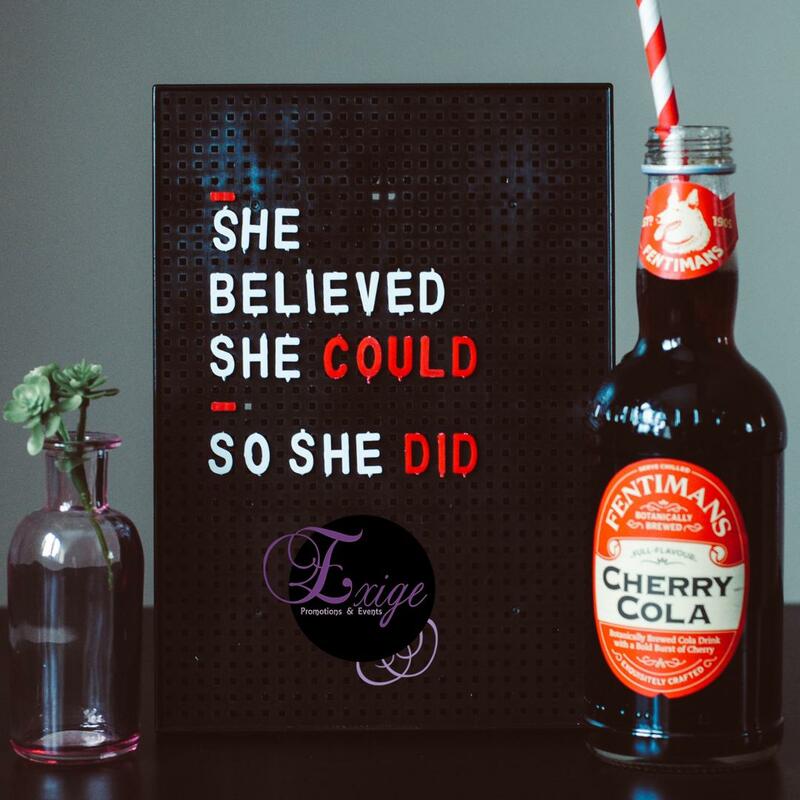 At Exige Promotions and Events, we are VERY passionate about what we do, and will go to great lengths to ensure your brand activation is a success. You can give us a like on Facebook here to be kept up to date with the latest promotions and events we have done. We also offer promotional and branded items such as caps, tshirts, lanyards, bags, pens etc for all of your branding needs. Please contact us at branding@exigepromotions.co.za so that we can quote you on any branded items. When you run events, you need a reliable partner. In Exige we found just that. Always spot-on, 100% present and making the impossible possible! Needless to say that their hostesses are incredibly friendly, sociable and beautiful! It was a delight to work with Sandi and the rest of the team! Just a quick note to say how pleased we were with the hostesses you provided us with for the launch of our new website! Punctual, professional, articulate and greeting our guests with a friendly smile! We will, without second thought, be using Exige Promotions & Events for our next event! We are a corporate eventing production company who put together elaborate events for some of the countries biggest corporates. We use promotional staff at 80% of our events, and it was only after discovering Exige that this has become a pleasant experience. We have been using Exige Promotions and Events for a year and a half and have had nothing but excellent service. Their staff is always presentable, friendly and reliable. We have not had any issues at any of our events, compared to what we had to deal with in the past this is unheard of. Exige staff is always on time, take instructions well, professional and always willing to help (even with things that are technically not part of their “job description”). We would definitely recommend Exige to any of our clients and would be confident that they would receive the same amount of professionalism and dedication that we always have. Thank you Sandi for providing a stunning model for our outdoor 4x4 shoot. She was professional throughout and an absolute pleasure to work with. Sandi Joseph and Exige Promotions were called upon to support BEN and the City of Cape Town in the promotion and hosting of the Tour d’Afrique, a globally recognised international mountain bike race from Cairo, Egypt traversing the African continent to Cape Town South Africa, in May 2011. Although the team had short notice to pull a great support cast together in what amounted to a new prospect in event management, given the unique nature of the bicycle event, Exige fulfilled the task with great skill and commitment. The weary 80 cyclists, having covered 12000 kms over 100 days, were treated to an arrival at the base of table mountain with hostesses, food, drink and a social environment in which they could meet friends, lie down, listen to presentations, and enjoy the beauty of the mother city. Exige took care of all of the needs of these tough warriors, delivering all that they required, and presiding over the protocol of the City and Provincial VIP and staff who were there to welcome the tour in. I would heartily recommend both Sandi and Exige for all event hosting, as they present a professional, artistic and unique take on bringing great excitement and fun in a most professional manner to the day. On behalf of all of us @ M Couture, our heartfelt gratitude goes out to you for sponsoring the models @ our Fashion Charity Benefit in aid of Cancer. Your girls were professional, punctual, reliable and an absolute pleasure to work with. They played such a big role with the launch of the AURA Collection, as they modelled the brand with absolute grace, confidence and elegance, which is exactly what we stand for. The proceeds of the evening amounted to R16 000, in aid of CANSA, something that you all can certainly be proud to have been associated with. Just wanted to pay a compliment to the girl that did bar-tender duties. Great personality , did her job and fitted right in. Well done on having this calibre of people on your books. I have been using Exige for all my casual and temporary eventing staff since 2011. Without fail the staff members supplied by Exige have proven to be very dependable and eager to work. My projects have stretched over the whole of South Africa and I have used Exige for staff in major cities such as Bloemfontein, Durban, Johannesburg, Cape Town and Port Elizabeth to cities likes East London and Polokwane. I have also occasionally needed the staff in smaller places like Kimberley, and Exige was able to provide quality staff for all my needs. I have made use of, from administrative staff, through to stage hands and drivers. On all areas, Exige has been able to deliver and I can highly recommend their staff as they are courteous, well presented and able to handle most tasks at hand. I am looking forward to many more years of working with the staff from Exige. Thank you Sandi for your collaboration in making the launch of Magic Africa Tours & Safaris a real success. Your hostesses were punctual friendly and very professional! We will not hesitate to use Exige for any future promotions. We contacted Exige for help for a seminar where we were showcasing the latest IT LOOKS to L’Oreal Professionnel hairstylists, our clients, sharing techniques in regards to colour and styling. For this we needed models with good healthy hair. I used to be based in Jhb and in Jan 2014 moved to Cape Town and didn’t have the network I usually have so contacted you after googling promotional girls, thinking someone could maybe help. You were amazing from the beginning and definitely were more than helpful! The girls were gorgeous and there was such a turnout that we used more girls than we thought because they were so amazing! The seminar was a great success and for that I thank you and your girls. You have helped me so much and I will definitely be in touch again so you can help us with more pretty, professional and punctual girls. Thank you again and I will be in touch in regards to what is coming up next month. Thank you for providing us with a promotion lady for our event this past weekend. We were very impressed with Aley, she did a fantastic job! Table Mountain Chocolate (Pty) Ltd.
We here at Diva Cuisine would like to thank Exige Promotions for providing us with such excellent services. With the help of the lovely Exige Promoters, our Clubhouse was able to receive the publicity it required. Exige Promotions is my go-to business with regards to promotions and I will definitely continue using them for any future needs. I confirm that I have used the services of Exige Promotions and Events, during which time they have provided our company with excellent support in the areas of promoting our products at an exhibition. Exige staff were very professional and assisted us with all the requirements to promote Optimate SA. I can confidently recommend Exige Promotions and Events as an excellent company to assist will any of your promotions or events; they are very reliable, professional and confident in what they do. Exige Promotions and Events is a very professional and reliable company which provide well presented and professional staff. What makes them unique is that they are always in contact and provide great feedback about customer interactions after each promotion. I would highly recommend their services.